Install and configure a headless Deluge server, and connect to it with the Deluge client. This guide is tailored towards Debian, Ubuntu, Fedora, OpenSUSE, and Arch Linux. A working install of one of the supported distributions with root privileges. There are tons of ways to manage torrents on Linux. Many of the available clients are excellent, but some have distinct advantages. If you're looking to manage large numbers of torrents and manage them over your network, Deluge is easily the best option. Deluge relies on a client-server model. The Deluge daemon runs on a designated server machine that handles the download and upload of files. 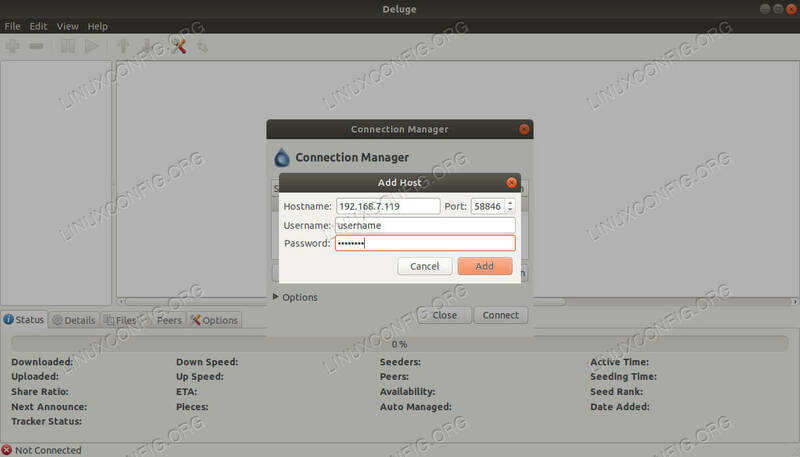 Then, you can connect to your server using the Deluge client on any computer on the same network to add, remove, and manage your torrents. It doesn't hurt that it's very simple to control your torrents with Deluge either. It lets you easily add torrents from a variety of sources and even control their priority and place in the download queue. Deluge is open source and well-supported across most distributions. You can install everything that you need from your distribution's package manager. You're going to need to do some setup on your server before you can take full advantage of it. The first thing that you're going to need is a user to run the Deluge daemon. Using a separate user is both more secure and lets the daemon run autonomously more easily. Start by setting up a group for Deluge. Then, create the Deluge user as a system user with their home directory as the main Deluge one. Make that Deluge directory and give your new user ownership. Next, you're going to need to log in to your new user, and start up Deluge temporarily to configure it. In order to do that, you'll need to sign in as your Deluge user. Start up the daemon, and open the console client. Once you're in the console, you can change the setting you need to. Enable remote access. Exit the console, and log out as your Deluge user. You're going to have to stop the daemon too. The number at the end dictates the privilege level of the user. 10 lets you do anything. In order to run Deluge as a service when your server starts up, you're going to need to create a systemd service. The Deluge developers actually provide one on their website for you to use. Create a file at /etc/systemd/system/deluged.service. Paste in the following configuration. Save and exit. Finally, you can start up and enable your service. You're now ready to start setting up your Deluge client. 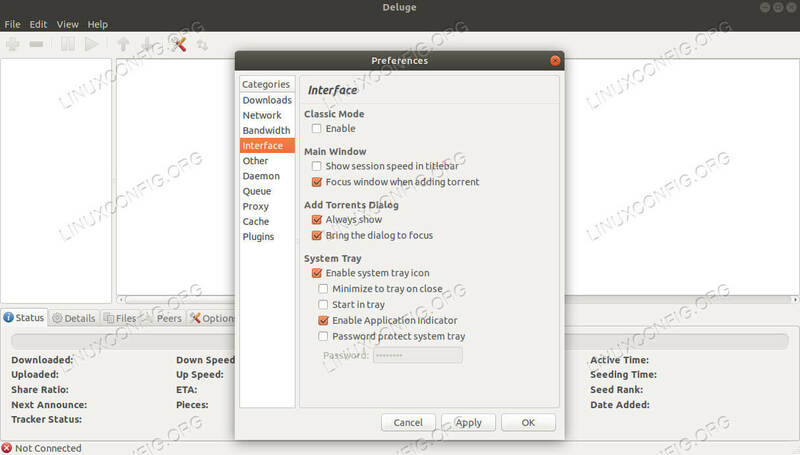 The Deluge client is GTK based, and serves as the control center for your server. Once again, it's available in your distribution's repositories. Open up the Deluge client. Click on "Edit" at the top. Then, select "Preferences." On the left side of the window, click the "Interface" tab. You'll see that the top heading is "Classic Mode." Uncheck that box to disable it. Return to the main menu. Click on "Edit" again. This time, select "Connection Manager." In the new window, click the "Add" button. Punch in your server's IP as the server name. Then, use the username and password that you set up for Deluge on your server. When everything's right, add your server and connect. You're ready to start using your torrents. You now have a working headless Deluge server. You can access and manage it from anywhere on your network. Depending on how you want to use your server, you might want to set up a VPN connection and a firewall killswitch too.